Custom water guns offer loads of fun to kids especially during the summer. You can drench your next campaign with fun by giving away these custom printed water guns. It will bring lots of fun when kids use it and at the same time your brand logo will get deeply etched in their consciousness. So why don't you invest in some best seller CPSIA complaint water pistols today? You can easily get it at Promo4kids.com. We offer attractive price savings on bulk orders along with free online design proof and free artwork assistance. Available at guaranteed lower prices, you can easily expect 100% customer assistance and fast production time. Make use of our fast shipping anywhere within the contiguous USA. Are you looking for a final set of products that will make your next promotional outing fun-oriented? Do you want to make kids take note of your advertising this summer? Perhaps custom printed pistol water guns are the only answer! These high-quality water toys offer fun all year around and are the best during summer months. You can cool your customers on the day of your celebration or event with these water guns and turn any boring event, picnic, party or parade into a full-fledged water war for kids with these promotional water guns. Do you know squirting water guns are the favorite American pastime? You can order it for your next event and stay cool about their chances of clicking with the young crowd. Available in various attractive designs and colors, you will have lots of options for your event. Kids can always squirt these water guns while playing on a summer day, during the beach parties, beach outings, company picnic, family outings or while pulling harmless pranks on their friends! In short, kids and their parents will have a blast with these water guns. 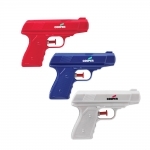 Logo printed pistol water guns are ideal for marketing theme park, water park, summer camp, kids play zones and any other kid-friendly or non-kid friendly business. 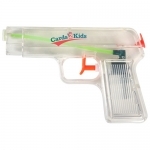 All our water guns are refreshing promotional giveaways for kids. We also have other types of cool promotional water guns in our selection, so you can easily choose a product for your campaign. With your brand logo printed on the barrel of these pistol water guns, your business can easily attract attention of young customers and their parents. Get ready to hit your customers with a stream of brand impressions with any of these custom pistol water guns. Place your order at Promo4kids.com at guaranteed low prices! Our team of promotional experts is available for your assistance at our toll free number at 855-454-3786 or you can write to us at info@promo4kids.com. Be it your doubts, queries or skepticisms about water guns or any other promotional toys for kids, we will happily assist you.